Sometimes it can be hard to see things from the eyes of another. You might think you have it all figured out, but so does the other guy. But especially when it comes to dealing with someone involved with your children, like coaches or teachers, it’s important to keep their point of view in mind. And of course, they should try to do the same! 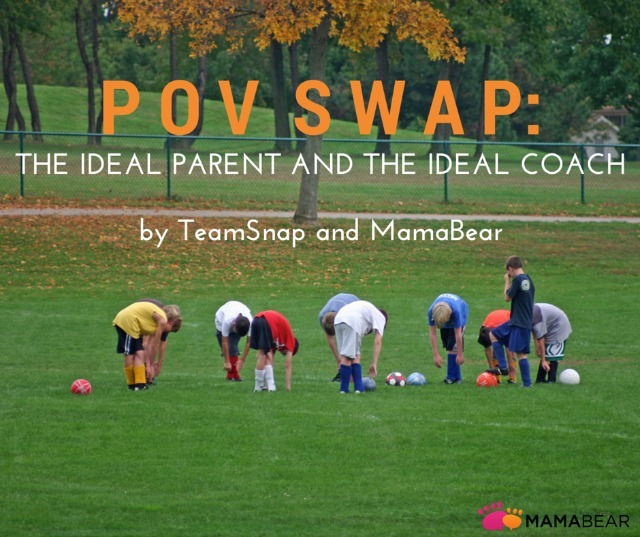 With that idea, TeamSnap and MamaBear decided to pull a “Freaky Friday” sort of swap, with MamaBear exploring what a parent’s idea of an ideal coach is and TeamSnap expounding on the coach’s idea of what the ideal sports parent is. Coaches are role models, mentor figures and advisors — sometimes for life, sometimes only for a season — but they sure do make an impression on our kids. Our active, on-the-go MamaBear families rely on their kids’ coaches to help shape the meaning of hard work, camaraderie and reliability. Here are our top three observations of an ideal sports coach. Inspire. The team talk at the end of every game doesn’t have to be a Jimmy V. tearjerker, but there’s nothing more motivating than a good ‘ol coach pep talk. Certain phrases from coaches will be carried on and used in our kids’ lives well beyond playing sports. The influence coaches have to inspire determination can be more meaningful than realized. Communicate on level. The instruction from a coach to “back up” could mean a couple of things to a 9 year old up to the plate in a baseball game. Step further back in the box toward the catcher? Take a step away from the plate? Rather than continue restating “back up” with no real response from the player, give more detail, realize they don’t understand what you’re instructing and try another approach. Every kid comprehends instruction differently. Have Fun. We’ve all seen the frustrated coach yelling, throwing his hat to the ground or storming off the field. The usual parent sentiment is, “Can’t they just have some fun?” Really. Lighten up. Instruction and constructive feedback will make the game more fun for everyone. Patience, self-awareness and a smile with a thumbs-up will go a long way. It takes a village to raise kids — parents, extended family, friends, coaches and MamaBear, too. We save you time and get you in the know with notifications about your kids’ daily activity in social media and provide peace of mind with location updates, all in an effort to get you talking about responsibility, safety and independence. We all know what “bad” sports parents are like. The stereotype is portrayed on TV, in movies, and we all see our fair share of them in person, too. But what do “good” sports parents look like? They offer to help. We all know it’s easier to criticize than to jump in and lend assistance. Ideal sports parents know this and not only offer their opinion but also their time, dedication and resources. Ideal sports parents volunteer to host the end-of-season BBQ. They volunteer for drink duty (or better yet, they volunteer to manage drink duty assignments using team management software). They offer their SUV for carpool runs. They understand that the coaches (often volunteers themselves) can’t do it all on their own, and they actively step up. They’re responsive. Every coach’s pet peeve is asking the same question a million times. Whether it’s checking to see who can make the game, asking parents to pay team dues or asking parents to update their contact information, coaches would rather be actually coaching than managing these administrative tasks. Luckily, sport team management software now exists to automate many of these tasks, but it doesn’t work if parents don’t respond! Ideal sports parents get their forms in on time, they update their kids’ availability status online or however it’s required, and they answer questions when asked … the first time! They control their emotions. Parenting is, by nature, an emotional experience. You want to guard your kids from anything that might hurt them and ensure they’re getting the best experiences they can from life. Keeping those emotions in check, especially in front of the kids, is an absolute must for the ideal sports parent though. Not only are confrontations between parents and coaches or parents and refs or even parents and other parents embarrassing for the child, they also undermine the authority of the ref or the coach, confusing kids about who they should listen to during a game or at practice. Surely, part of the reason you encouraged your child to join a team is to teach teamwork and responsibility, so exhibit those qualities yourself from the sidelines! Next time you’re asked to do something by the coach or attending your child’s game, ask yourself, am I doing all I can to be the “ideal sports parent”? And check out the TeamSnap youth sports blog and podcast for more on the sports parent experience.